A letter by Florence Nightingale expressing her vision for community nursing has been found during a clear-out at a London hospital. 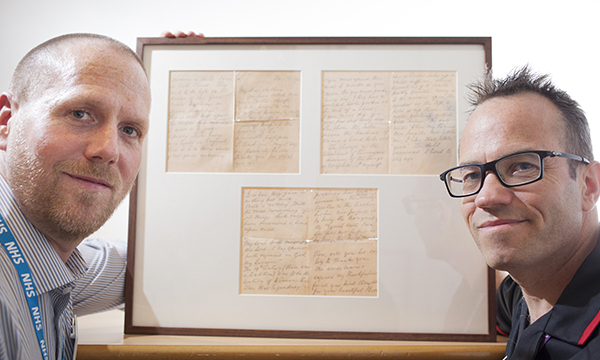 The framed lithograph copy of a letter written in 1900, was discovered in a dusty frame in a disused office once occupied by chief nurses at the Royal Marsden Hospital in Chelsea. Miss Nightingale wrote a letter each year in May – around the time of her birthday – to young women finishing their training at the nursing school at St Thomas’ Hospital, London. Every probationer would have received a copy of the letter. In the letter Miss Nightingale writes: ‘Nursing is become a profession. Mr Sullivan said the letter showed Miss Nightingale’s vision, identifying the need for community nursing more than 100 years ago. ‘That was her vision. She had developed professional nurses in hospitals and could see the need for nurses in people’s homes, even then, at the turn of the 20th century. The Florence Nightingale Museum has confirmed the lithograph dates from 1900. Collections officer Holly Carter-Chappell told Nursing Standard: ‘Each student was given a lithograph copy, so I would say there were probably about 30 of each letter. The letter now has pride of place on the wall of Mr Sullivan's office. 'It's important to preserve a significant piece of history,' he added.